I'm going to Prague every second or third weekend visiting my friend and so I'm looking for some places close to Prague for outdoor bouldering. Does anyone know some rocks close to the center? Thanks in advance! I coming in Prague some weekend. and I am glad if someone can tell me some good outdoor shops. Name and address? I've recently arrived in Praha and I'm looking for some people to climb with. I climb fairly easy stuff and have a sports rack. I've climbed all over the world, but will be in Praha for a year teaching. I'm looking for good bouldering in Czech Republic especially in sandstone ( I've been in Petrohrad :) does anyone knows some places mayby near Teplice or elseware sand me some info on the_notic@o2.pl THANKS!!! did you ever get in contact with Tom? Hi, I will be goning to prague soon are there any good climbing shops there? 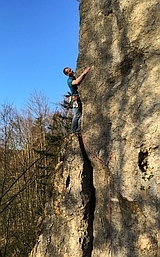 The best area for bouldering is Petrohrad near Jesenice 70 km east from Prague. I would like to climb in Adrspach. How would it be there the next weeks ? Last time there was a lot noisy schoolkids occupying the most of Camp Stransky .. And hardly no one for serious climbing ? ?